What a fantastic week this has been - Post Thame Fair sales have been amazing! But now....after finally sifting through the unsold Thame Fair stock, I've been able to get stuck into listing unsold handmade items. So if you have a moment, do please step inside KT Miniatures Little Handmade Emporium...and take a look at what's on offer (on both floors)! One or two of the new items have been highlighted below. 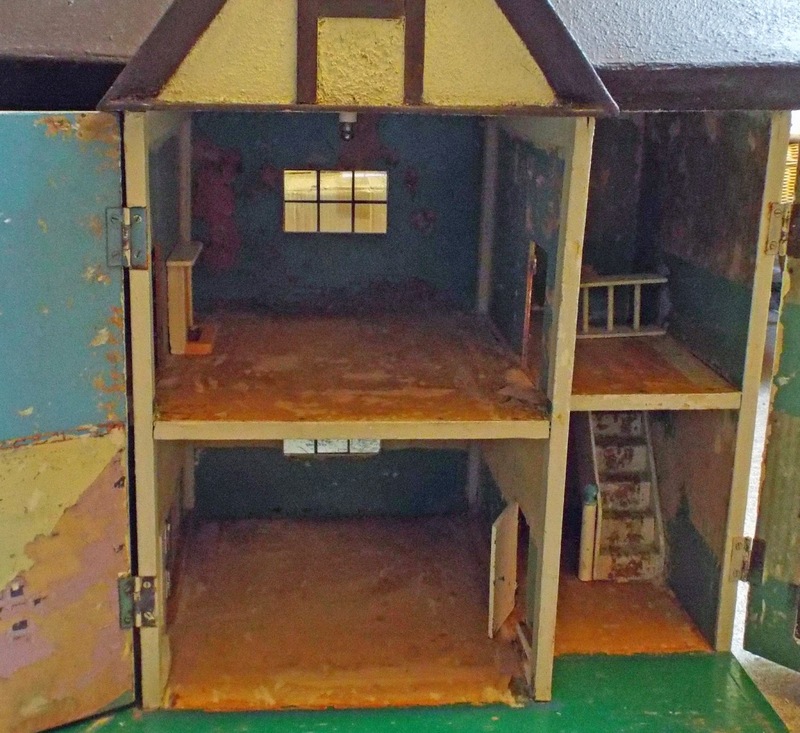 As always, many of the miniature items can be used in both vintage and modern reproduction dolls houses. 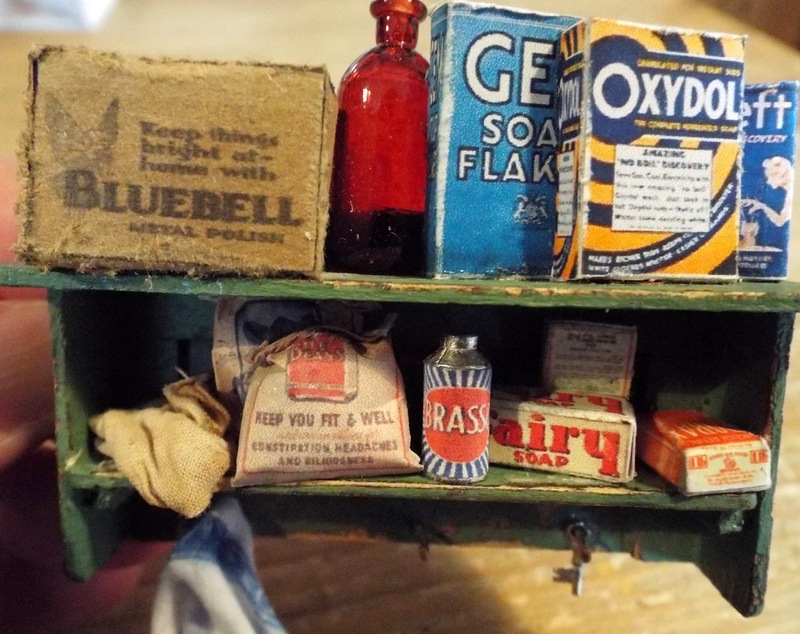 There are also some miniature scenes that include old dolls inside various antique containers.....and with Mother's Day looming...could possibly make rather nice presents perhaps? A peek at "Miss Dolly & All Her Friends!" Two different scullery shelves - suitable from the 1930s era onwards. 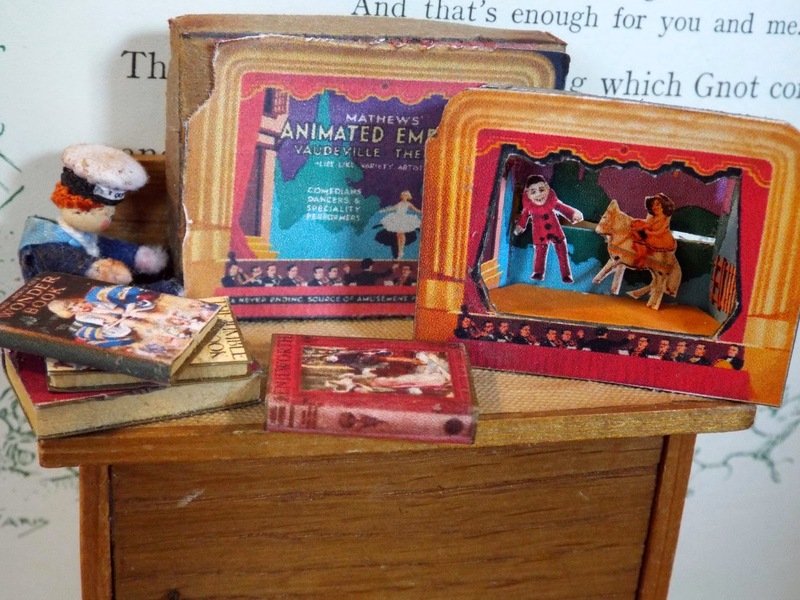 An old rather battered c1930s German cupboard filled with vintage style toys, including KT Miniatures handmade vintage books and c1930s Mathews Animated Empire Vaudeville Theatre! 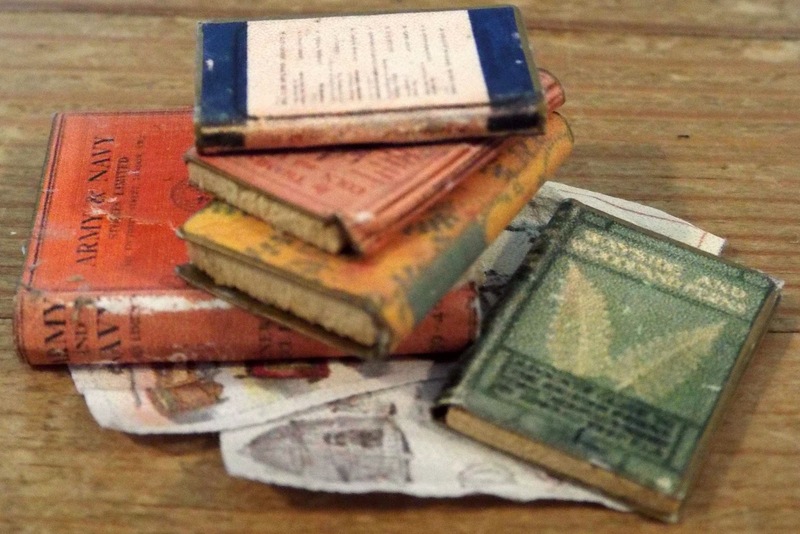 Various piles of old books in typical KT Miniatures style! 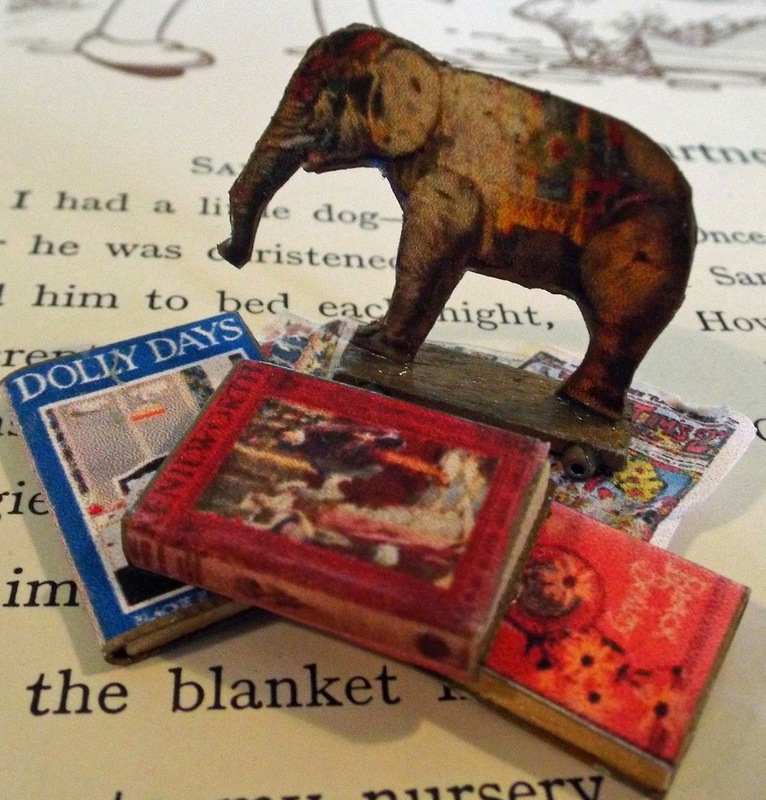 A pile of books with an old toy elephant on wheels! 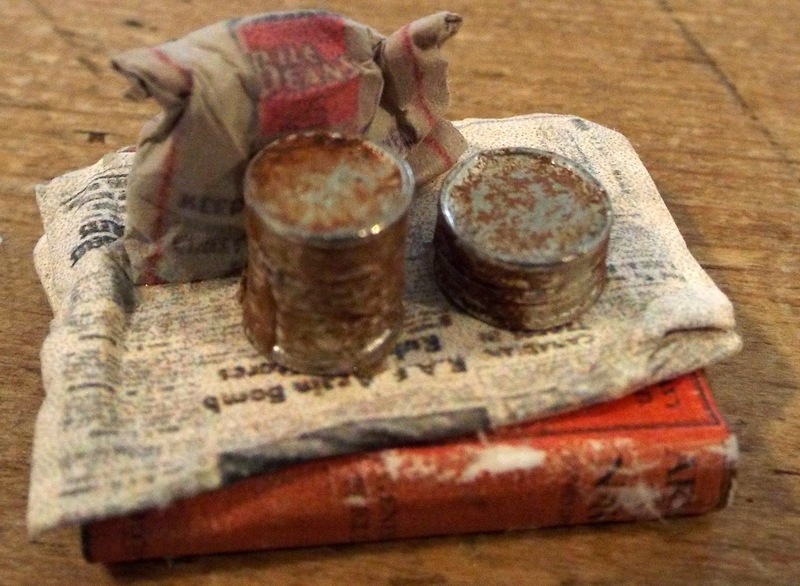 Old rusty cans on an old book, etc. 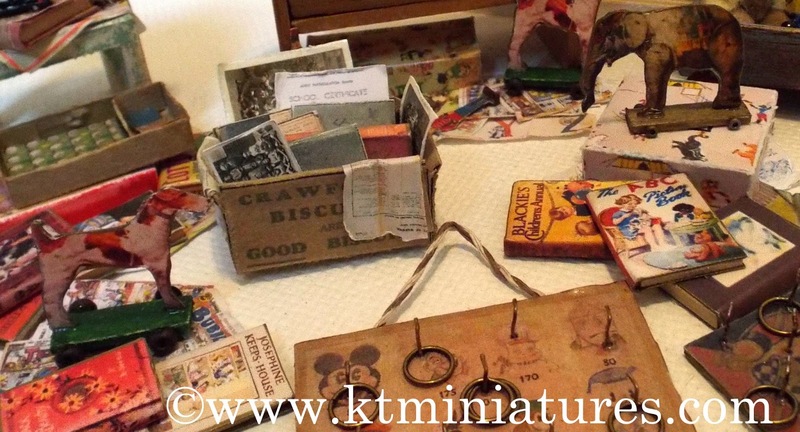 All these and much more can be found on KT Miniatures Little Handmade Emporium. 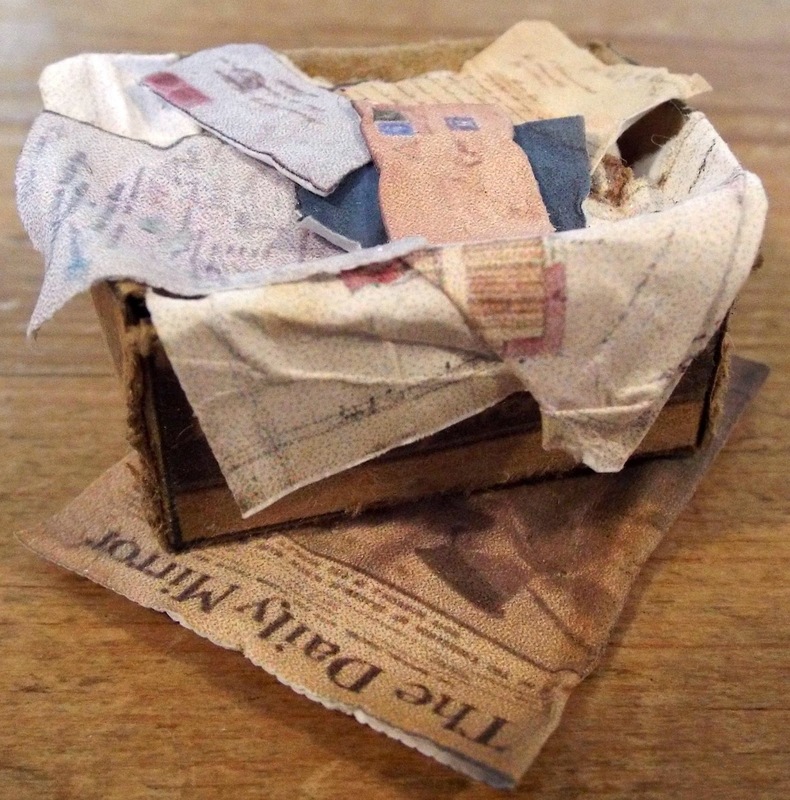 I will be having a break from "listing" over the weekend, as a deadline for yet another magazine project is looming rapidly and I need to put my creative hat back on! Ha ha...something that neither Robin (my workshop colleague) or I have EVER made before....so rather challenging indeed but hey....we are getting there! It is amazing what you can make out of an old leg of a pair of Marks & Spencers trousers...don't you think? Intrigued? Sorry, you are going to have to wait a few weeks and then all will be revealed.....ha ha! 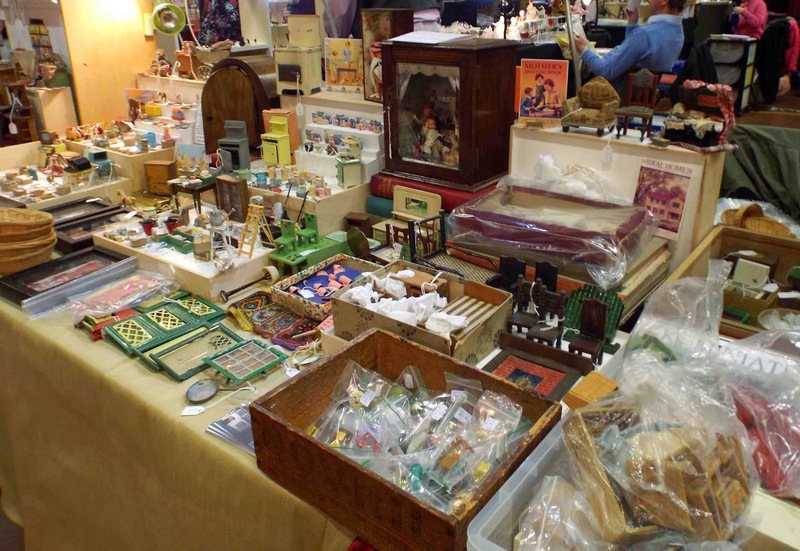 Next week, I have the lovely task of listing many of the unsold antique and vintage items from Thame Fair. And although much has already been sold, there are still some rather nice pieces to be had. What A Brilliant Day It Was - Will Start Listing Unsold Thame Fair Stock This Week! 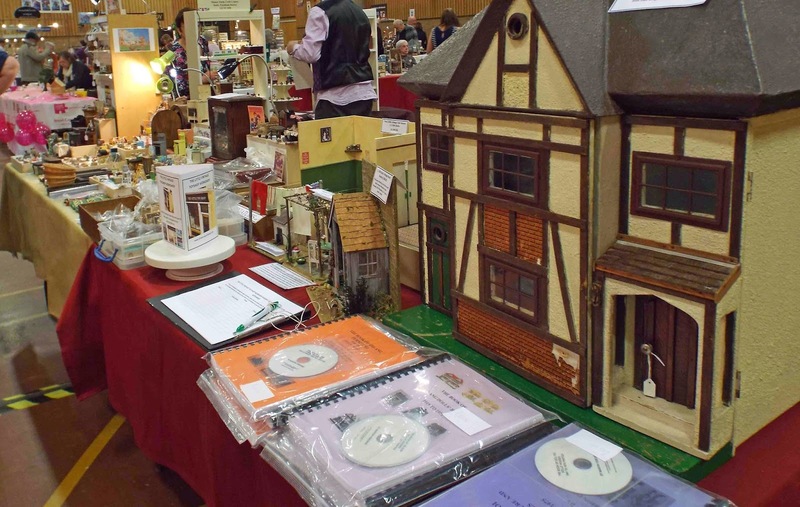 Many thanks to everyone who came along to see us at the annual Thame Dolls House & Miniatures Fair last Saturday....hope you had a great time, we certainly did! What lovely chats we had! I remembered to actually take my camera this time......and all these pics were taken with just a few minutes to go before the opening time. Sorry folks....my gorgeous G&J Lines No 74 was sold! 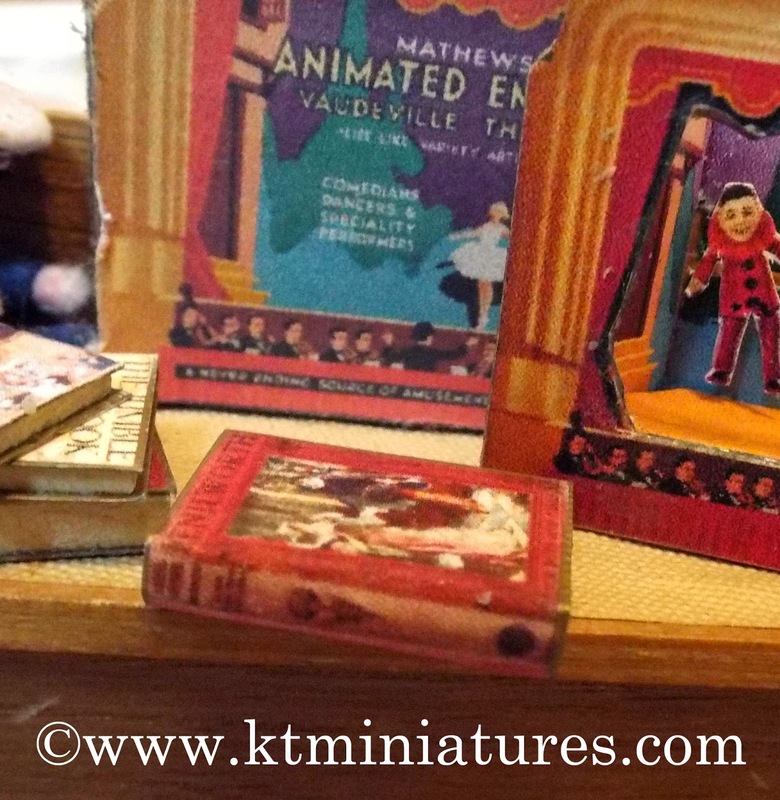 As always, much thought went into choosing a diverse selection of both KT Miniatures' handmade items, as well as antique and vintage stock. My helper for the day was daughter Kate (who was bribed to come back from uni especially for the event) and did a splendid job. She is doing a maths degree so put me to shame with her ability to do some amazing mental adding up.....I struggled along as usual with the calculator! Am delighted to report that much was sold on the day.......and once all the takings and after sales were added up, this turned out to be the second most profitable Thame Fair for us ever (I have been doing this fair since it's very beginning in 2004)! So a very special thanks to organisers Felicity and Ron for putting on yet again another lovely and successful event! Although there were visibly less people through the doors, many of the standholders still did good steady trade and the local club put on an exhibition of some of their creations. The charity stands appeared to be busy too, including the sales table. Sadly, as often happens at these events, one or two artisans did not do very well, I have given up trying to fathom out the reason why, as sometimes there just does not seem to be any logical reason for it, their creations were beautiful, stunning and competitively priced? But now, my BIG stocktake is done and I hope to begin listing some of the unsold stock to KT Miniatures website this week. 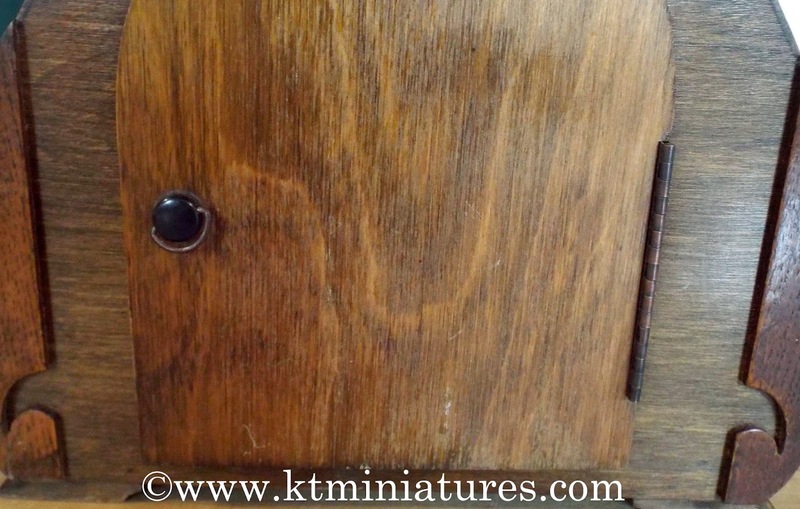 I will begin with the handmade items, which will appear in KT Miniatures Little Handmade Emporium - but please be patient as it takes absolutely ages to photograph and individually list each item. 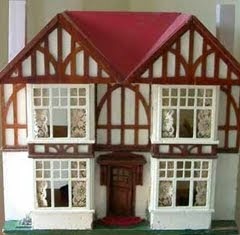 Final Posting Before Thame Fair....c1920s G&J Lines No 74 Dolls House! 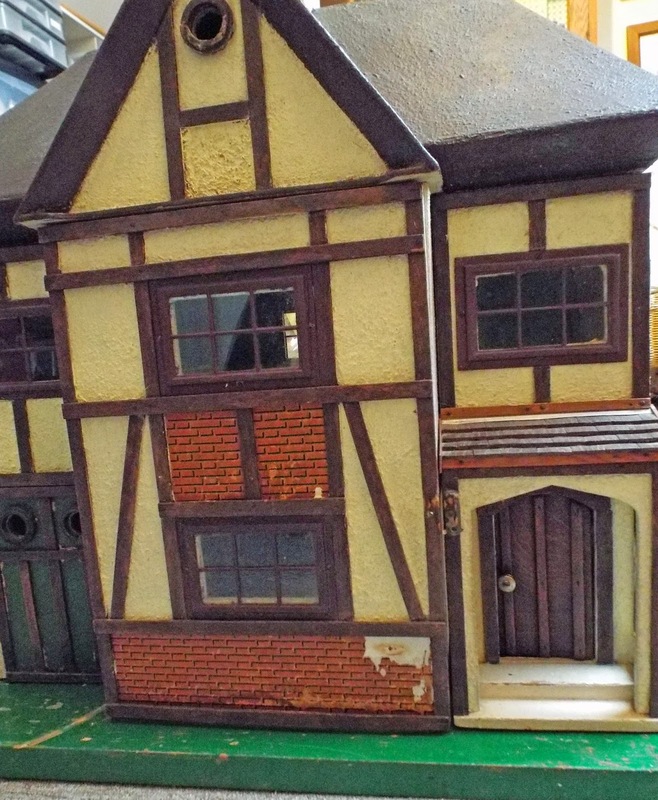 As promised, at last I've been able to put some photos on here of the lovely rare dolls house I'm taking to Thame Dolls House & Miniatures Fair on Saturday. I 've had this for 2 years would you believe, but after finding woodworm (in the base mainly) when it first came in, I immediately embarked on thoroughly treating in the usual way (4 treatments no less). I've not seen any movement in the past year, the holes are now filled in and it's been sitting up in my workroom for weeks. It is a joy to look at and to be honest, I've been completely torn on whether to keep it. The house is BEAUTIFUL and it epitomises the 1920s/30 style perfectly! But as there really is no more space left here, I've had to allow my head to rule my heart ... so with Thame Fair coming up, have finally made the decision to let it go to allow someone else to enjoy. The exterior appears to be in original condition....albeit a little worn...there is a tiny patch of the original brick paper missing on the front. I believe (but I may have this wrong) that there should have been a sun dial underneath the front round window, and it does appear that the tiny square underneath has a slightly different texture to the rest of the exterior? 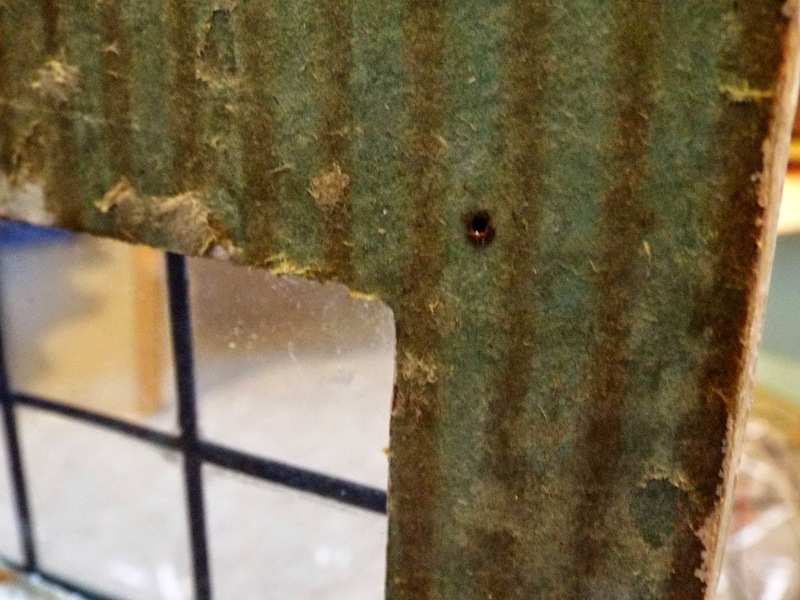 All metal windows are glazed with real glass and fully intact....it is just the round window with the wooden frame at the top that has lost it's glazing, so too the round wooden framed windows on the garage doors. The interior is a real restoration project...but what an amazing and exciting project to take on! I 'd already made a start quite some time ago. Inside, there were several layers of wallpaper that had been applied over the various decades, (on the floor as well as the walls)...and carefully the layers were peeled away but when I got to each final layer, disappointingly a previous owner had painted over most of the original papers! The good news was that I was able to salvage much of the red patterned paper in the little room above the garage....I say garage but in photos of another No. 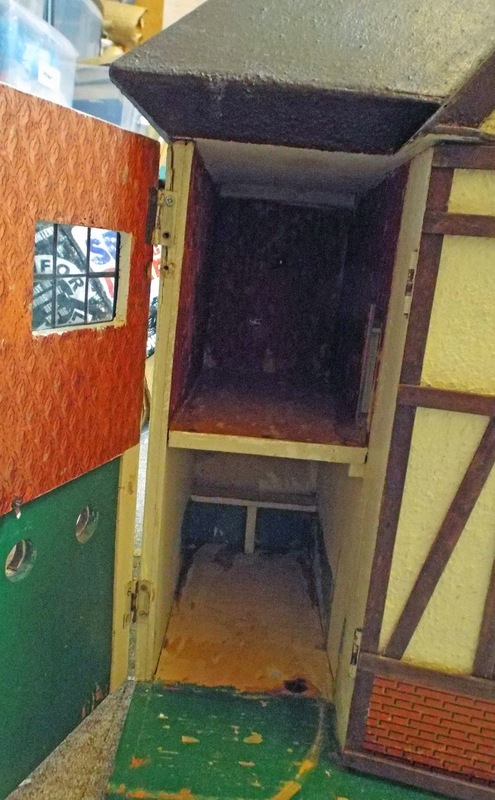 74, someone has used it as a kitchen...so there's a thought! There is a hint of the green striped paper in the hall and landing but someone has painted green gloss paint on the lower half all the way round on both levels. The back central panel opens to give access to the two main rooms, which is a nice touch. 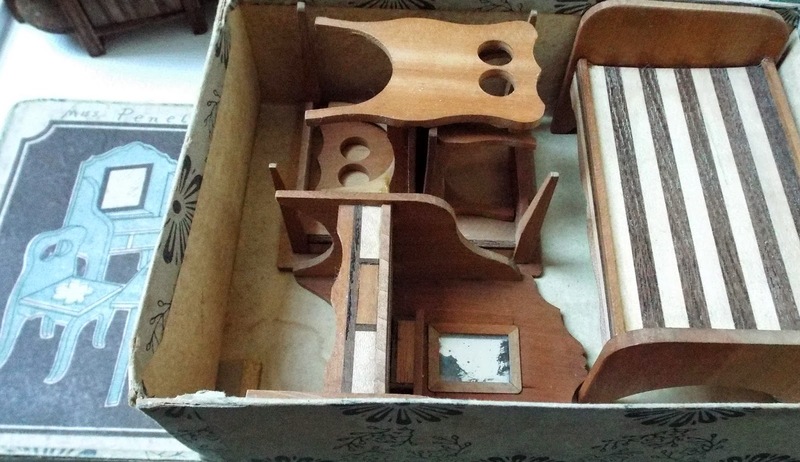 This house will be stunning once the interior is restored....and a lovely project for any serious dolls house collector, as this model rarely comes along. 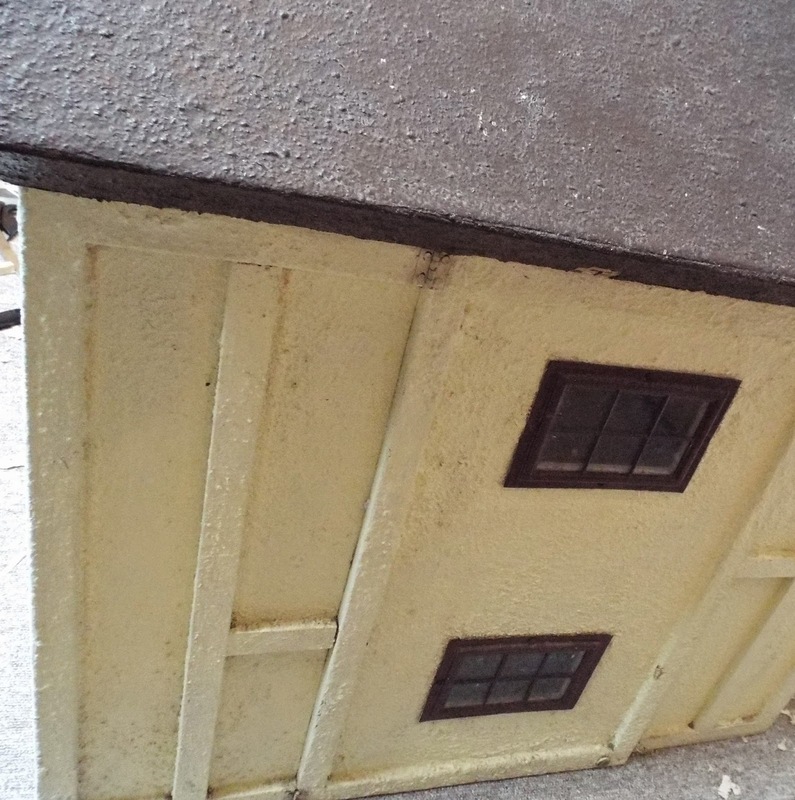 It is the only dolls house I'll have on my stand on Saturday, due to lack of space, and will be sold on a first come, first serve basis. Labels: G And J Lines No.74 Dolls House, Thame Fair Stock Page 2015. 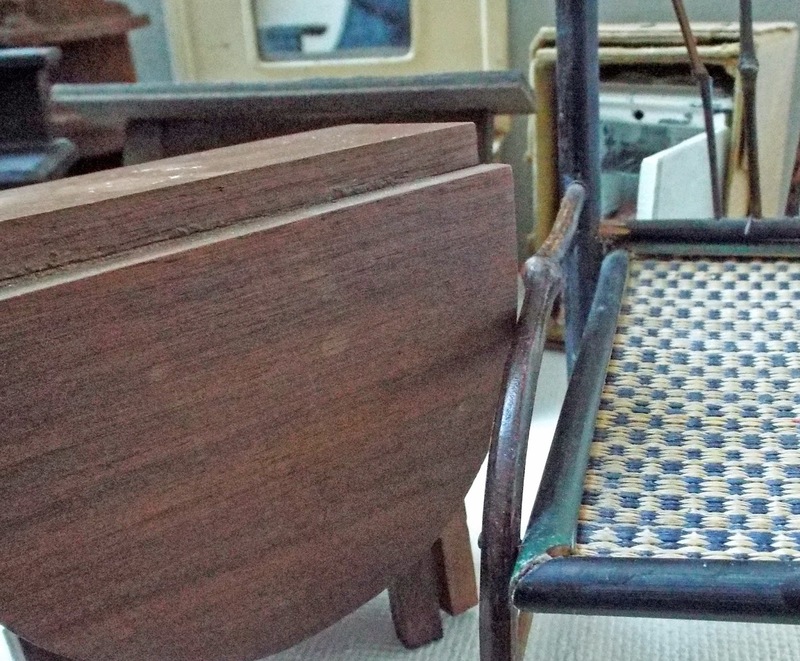 Sneak Preview Of Just Some Of The Antique & Vintage Mini Treasures That Will Be For Sale At Thame Fair On Saturday! 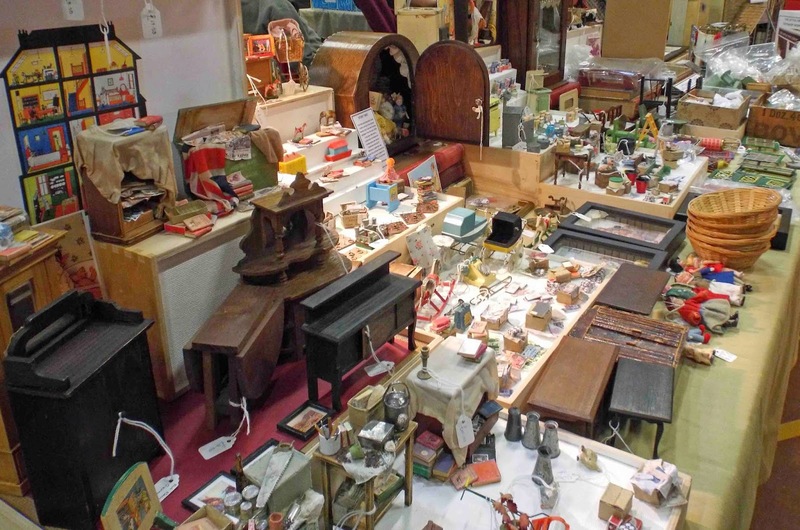 Well....with just a few days to go until the big Thame Dolls House & Miniatures Fair, I have the wonderful task of pricing and then carefully packing up some rather lovely antique and vintage miniatures in readiness for my stand on Saturday. 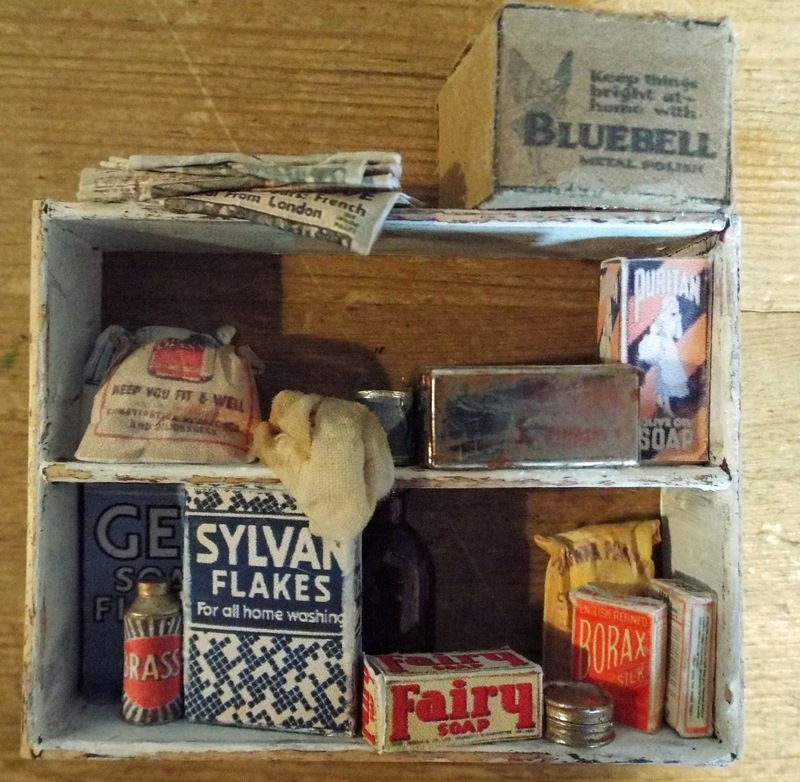 On the previous past two postings, I've highlighted some of my handmade miniatures to be sold at Thame...so now as promised, here is a snippet of just some of the lovely antique and vintage items I'll also be taking to Thame. Let's start with the oldest item.....a rather wonderful and rare c1880 Biedermeier Secretaire, complete with opening drawers and a drop down flap that reveals a green papered and mirrored interior! 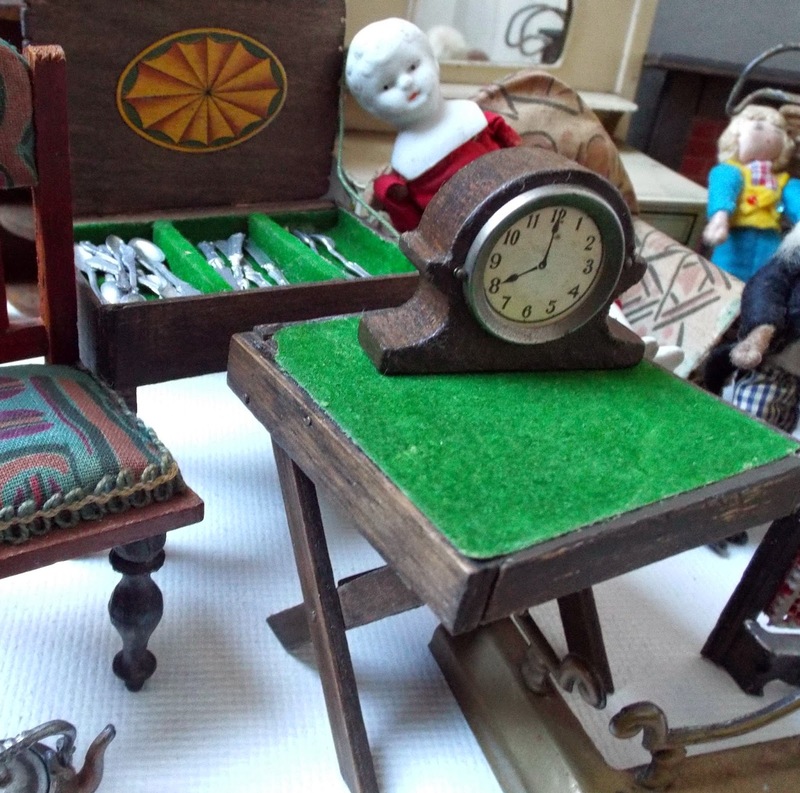 There will be various c1930s Pit-a-Pat items such as a canteen of cutlery along with cutlery too, a mantel clock and card table. 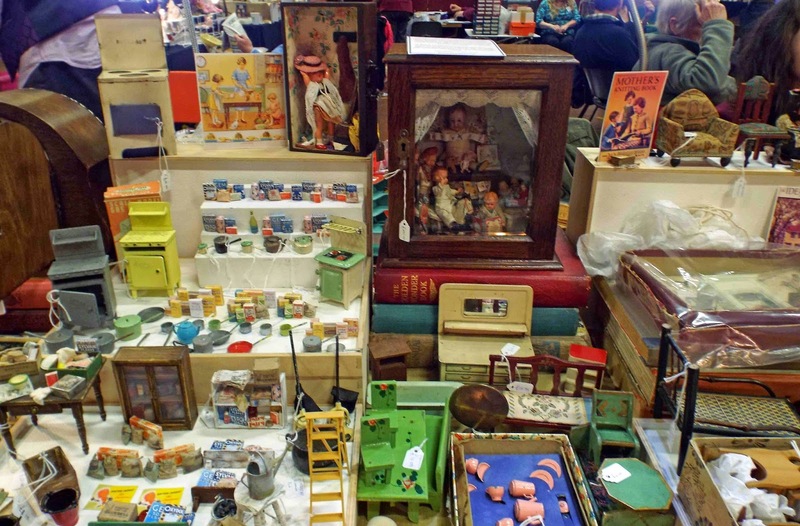 Plus there will be various German chairs of all shapes and sizes, Grecon dolls, bisque dolls, Dol-Toi Dolls, etc. 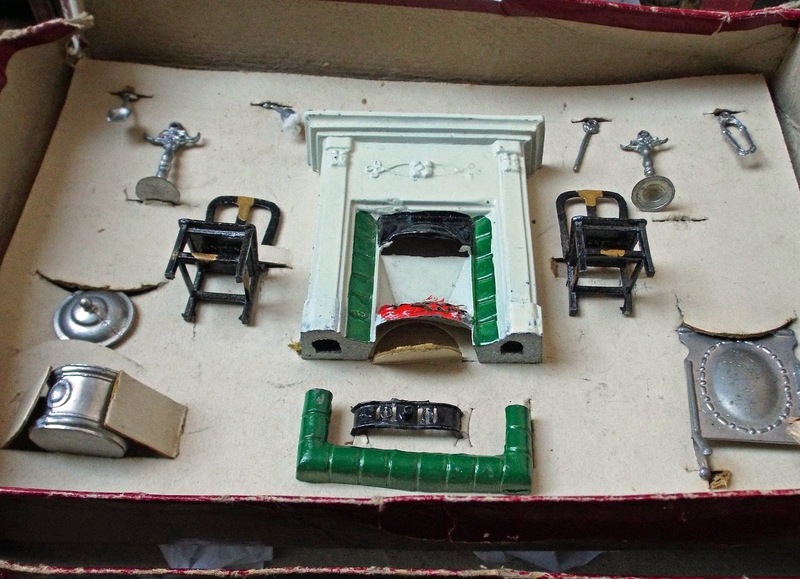 Rarely does a c1930s Boxed Taylor& Barrett Fireplace Set come along, all completely intact! 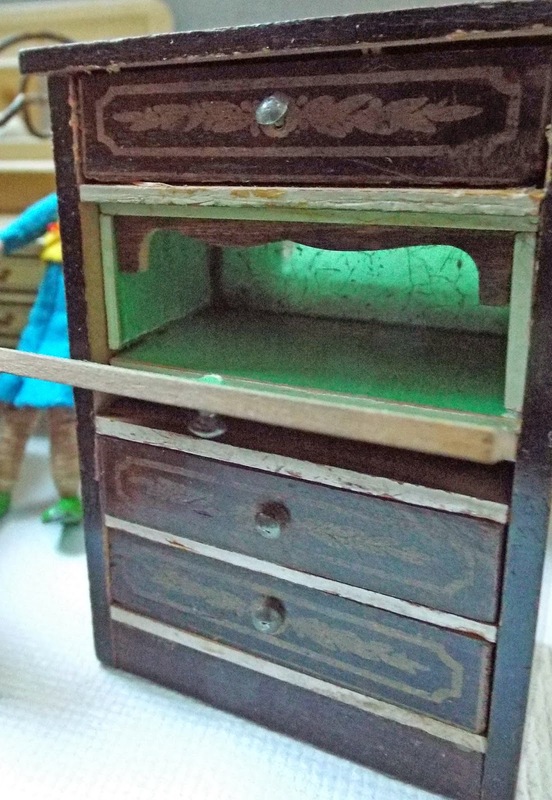 Then there is this rare c1920s/30s boxed Japanese Bedroom Set! 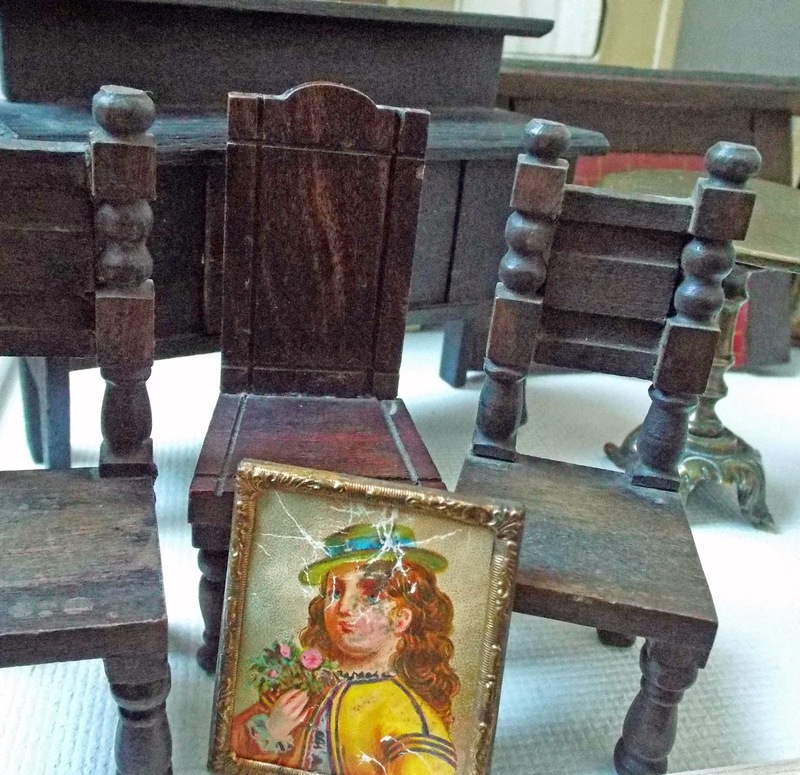 I will be bringing several c1920s Elgin chairs, a German sideboard, a c1900s soft metal framed child image, a Tri-ang fireplace and a late c1800s brass table with tilting top. There will be this delightful c1950s Circle Bakery Stores, complete with tin scales....rarely do these come along. And finally, there will be various other pieces of furniture such as this very old gateleg table which extends out at both ends, plus a rather lovely early 1900s cane chaise longue. PS. 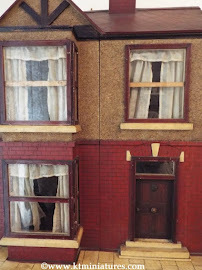 Shortly I hope to put up on here some photos of the gorgeous c1920s G&J Lines No 74 antique dolls house that will be available for purchase on Saturday...so watch this space! 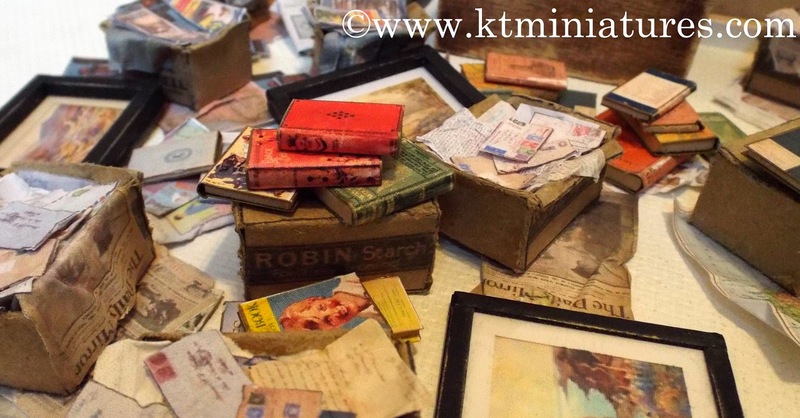 KT Miniatures Thame Fair Stock Page Now Live- Handmade Items! At long last I've been able to put a list together of stock that will be available to purchase at Thame Dolls House Fair at the end of next week, Saturday 21st February. I've been tucked away, busily creating these past few weeks and have highlighted below some of these handmade items. My stand is No. 30 (the usual place in the Main Hall by the main exit) - CLICK HERE TO VIEW THE FLOOR PLAN. In a few days time, I will highlight on here some of my antique and vintage items that will be available on the day (some are quite rare & real beauties). All unsold stock after the event, will be listed on KT Miniatures website. Thame Fair End Of Next Week And Ellie Ruddock's Beautiful Song! 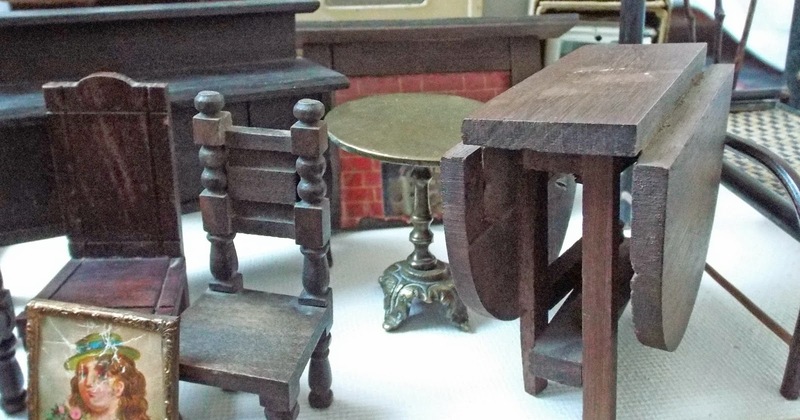 KT Miniatures preparations are now well and truly in full swing for the end of next week's Thame Dolls House & Miniatures Fair (Saturday 21st), which is now creeping up on us rapidly. 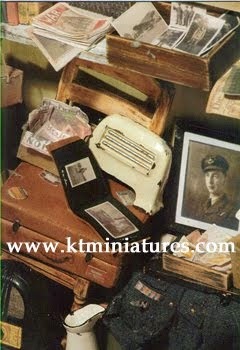 I will be putting up a Thame Fair Stock Page on KT Miniatures website very shortly, including some pics. Hope you can come! I would just like to tell you about a gorgeous talented young lady who comes from these parts (Oxfordshire) and who I've had the privilege to hear sing several times now at local gigs and music festivals, including the prestigious annual Towersey Festival. Not only is she a professional music therapist but also a singer/songwriter. 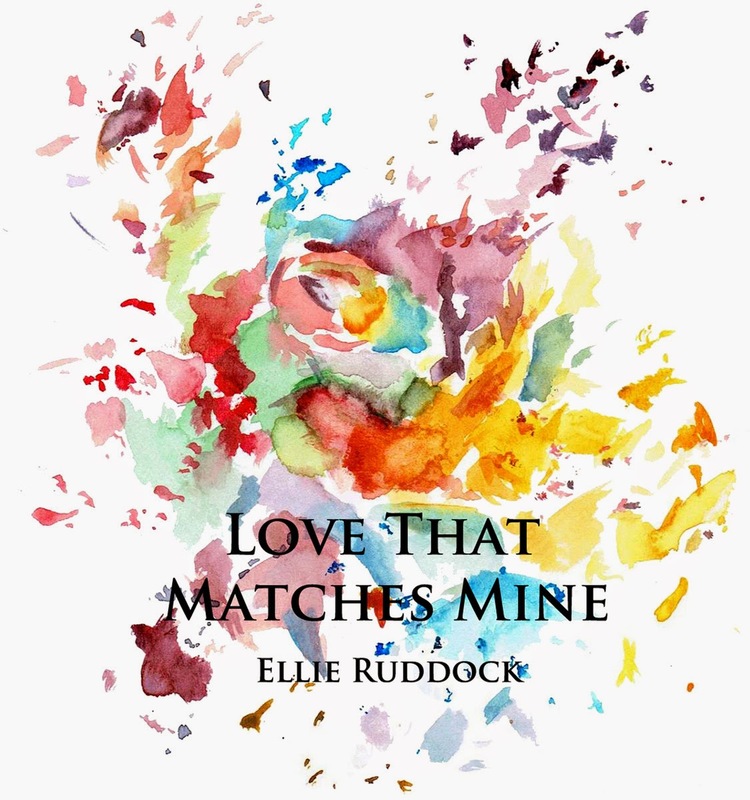 For the first time, we can now hear and download Ellie's beautiful "Love That Matches Mine" from the internet and I promised Ellie that I would tell you about it when it all went live. So if you have a few moments, please do click on the following link, turn your speakers on and enjoy! If you really love what you hear, for just £1.00 you can even download it!!! Big Dolly & All Her Friends Plus A Little Bit More Besides! 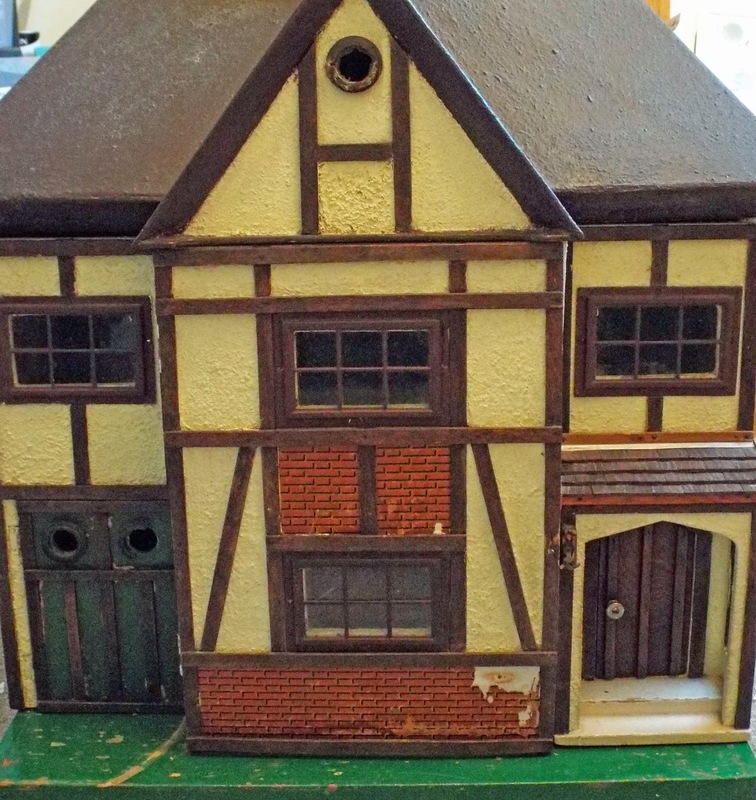 Just lately, amidst the weird and whacky chaos of real life here, I've been trying very hard to get stuck into some serious creating for the forthcoming Thame Dolls House & Miniatures Fair- being held on Saturday 21st February. 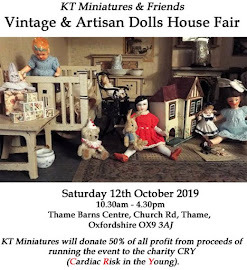 As usual I'll put up a Thame Fair Stock Page on KT Miniatures website a few days before the event, which will include both my handmade items as well as antique/vintage dolls house items that will be available to purchase from me on the day. BIG DOLLY & ALL HER FRIENDS is something I've been wanting to make for such a long time now and with that in mind, I've been collecting bits and bobs - mostly vintage and antique, including a beautiful antique wooden smoking cabinet with bevelled glass...just for this very scene. The stunning wallpaper used is antique and I currently do still have a little available to purchase on KT Miniatures - it' really is so pretty. 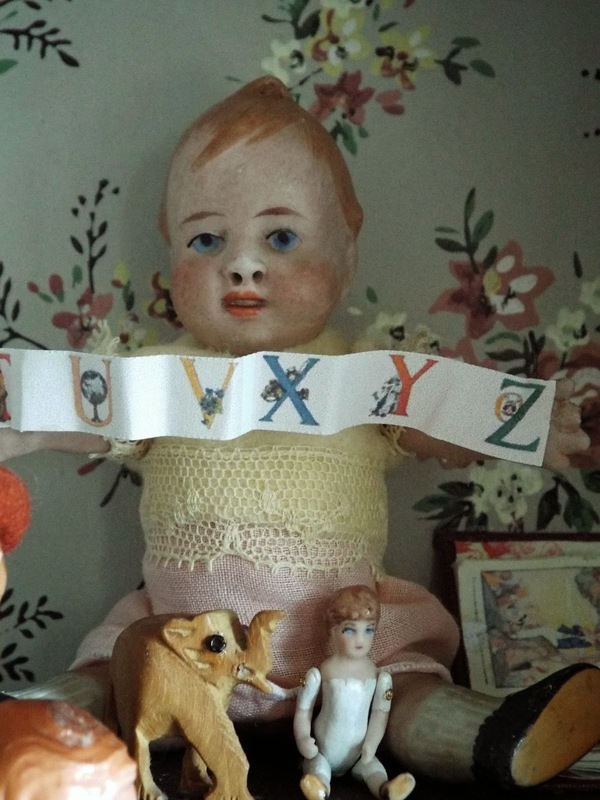 The centre piece is the beautiful bisque doll, probably early 1900s and German, she has such an enchanting face!!! 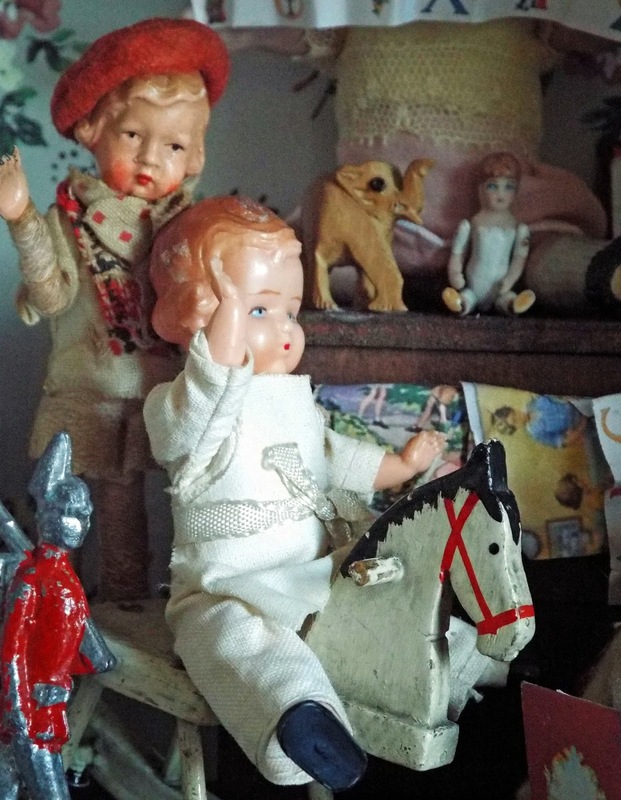 The other dolls are mostly antique and vintage, including the slightly odd Caco boy in a beret and the 1950s celluloid cook (who has mislaid his hat). The rocking horse is pre-WW2, minus its back rest but looks perfect in this setting. I tried to create a magical illusion that the dolls are actually alive and having a jolly good time when us humans aren't looking...haha! A friend dropped by the other day and saw this sitting on my kitchen table. 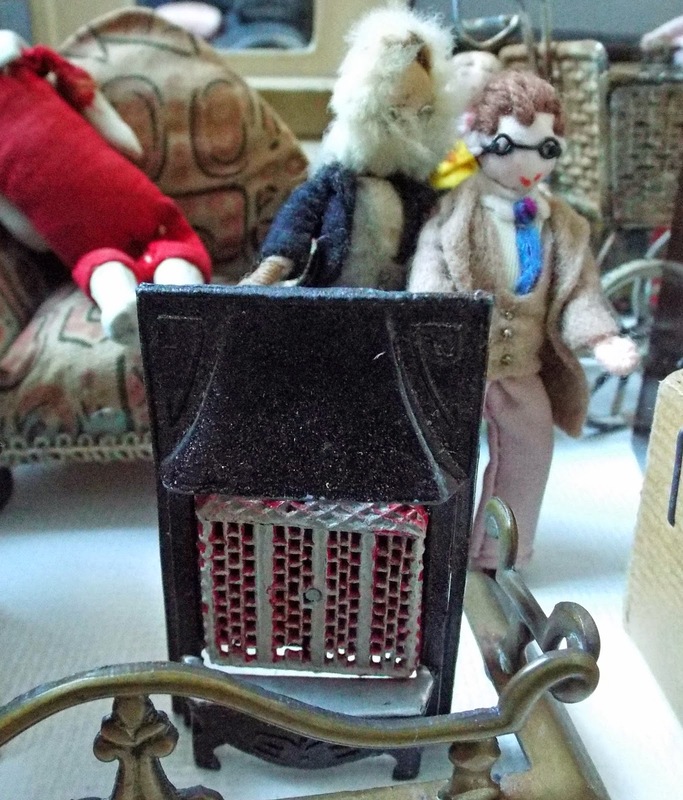 After muttering all sorts of lovely comments she finally concluded that the dolls almost seemed to be alive....hmmm so job done then methinks...haha! This little scene is called STORY TIME, another little scene that's been a long time in the making. 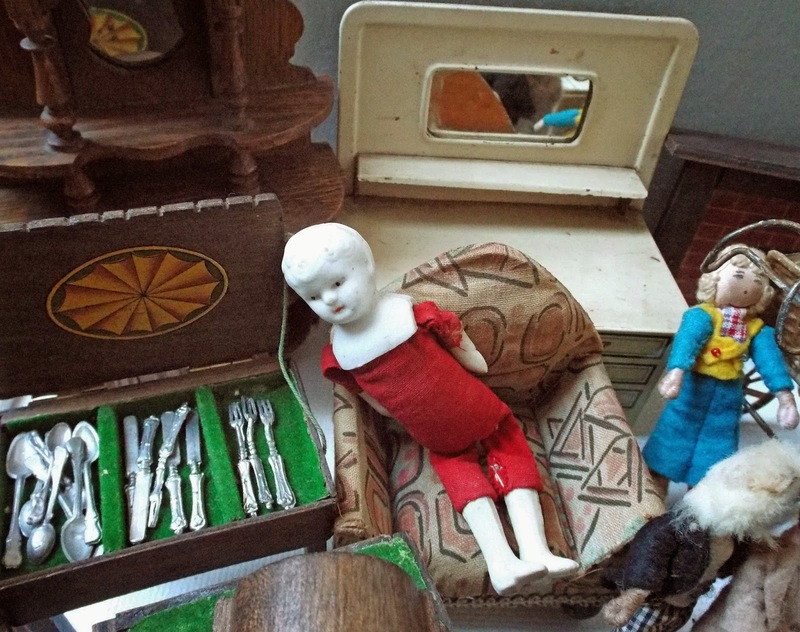 The wooden 1930s clock encasement was stripped of all its internal mechanism, then filled with a Victorian chaise lounge and various vintage and antique dolls of all shapes and sizes.....plus a duck and other oddities. I used a precious scrap of some early 1900s wallpaper to line the back wall - the patina of this old wallpaper is simply gorgeous. 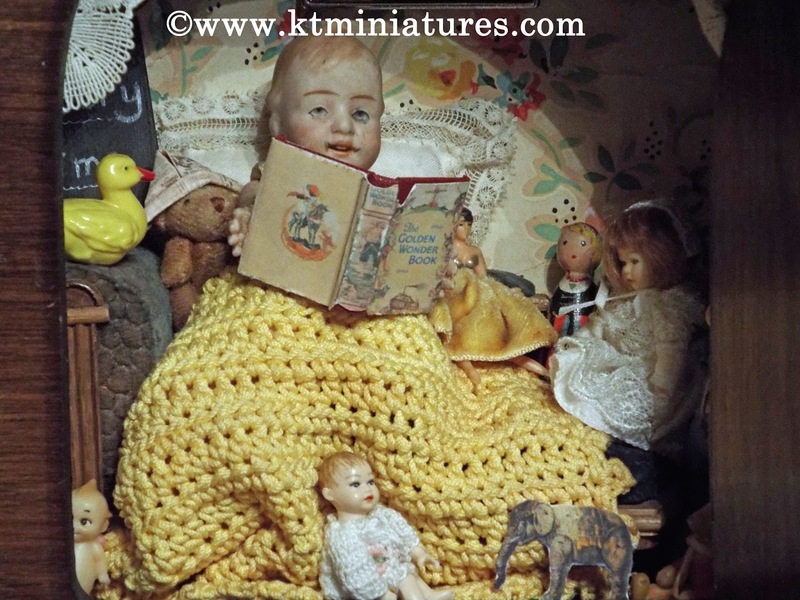 Tucked away in the corners of the encasement are more bits and bobs, including a blackboard, KT Miniatures vintage style books, antique lace etc. 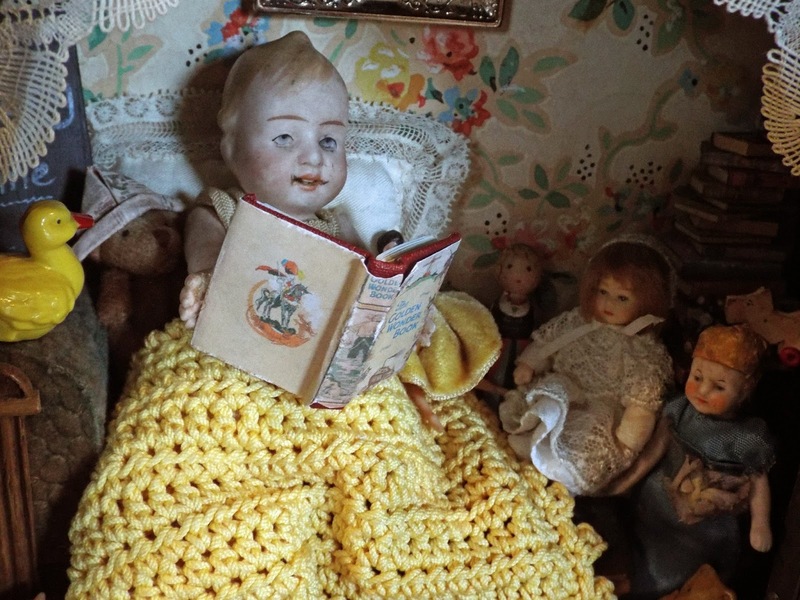 Big Dolly is reading a story from her rather well thumbed Golden Wonder Book, to all her attentive friends! 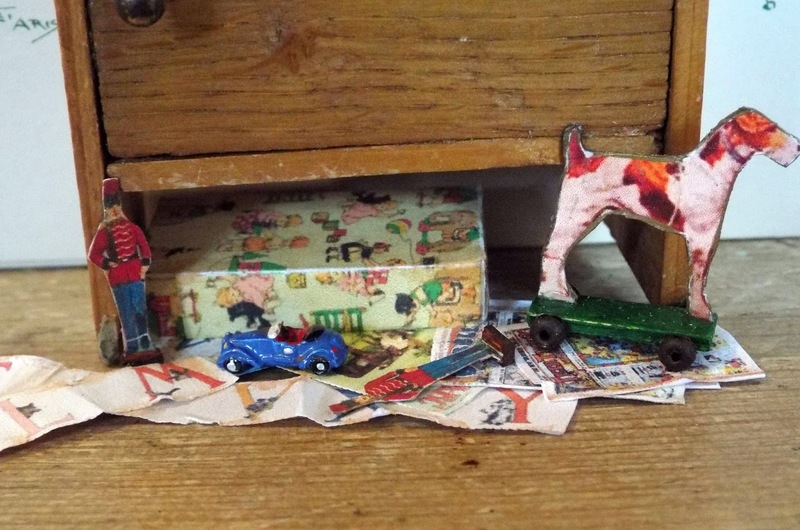 And finally...the third and tiniest of them all, is purely bonkers and made on a whim inside the redundant little drawer that was stripped out of the smoking cabinet! It is called....LET'S PLAY AT DRESSING UP! 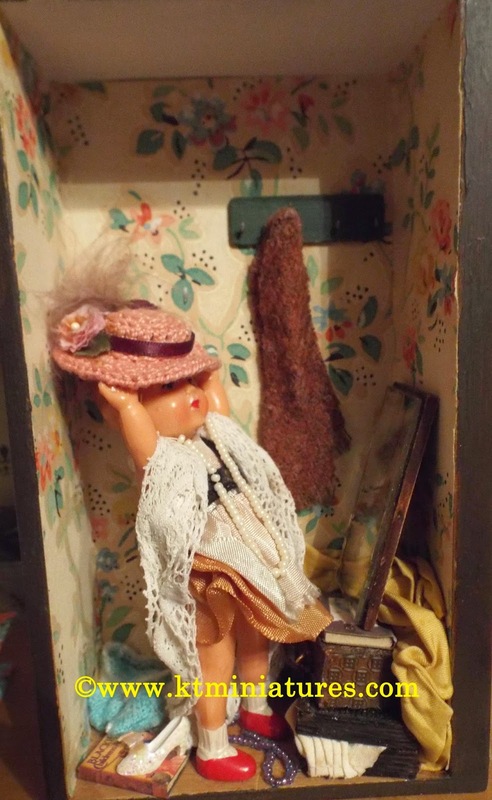 It is lined with the remaining scrap of early 1900s wallpaper, and the centre piece is another vintage 1950s doll that I have had simply ages. As I put this vintage crotcheted hat on her head, it slipped in such a way that immediately this scene took on a life all of its own and was great fun to do. I hope all three of these little scenes have made you smile! 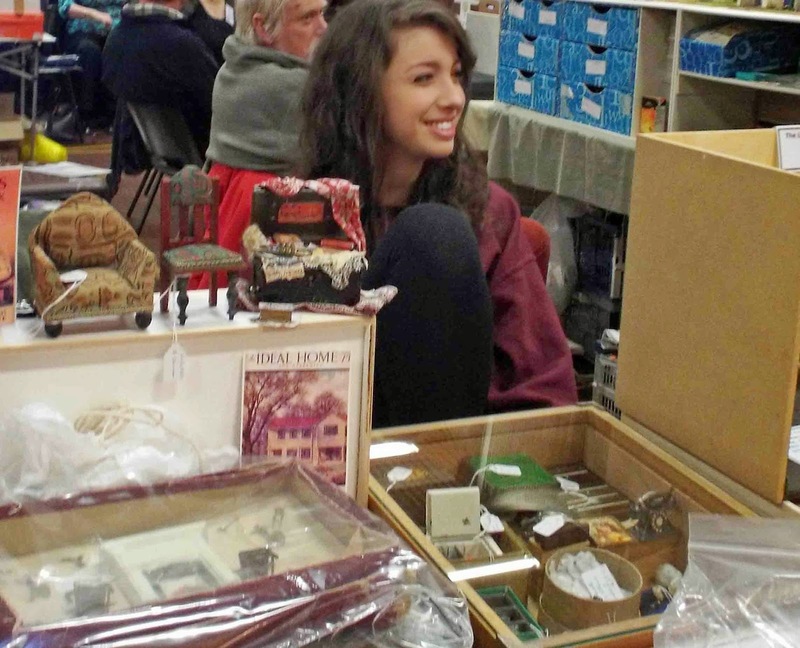 Thame Dolls House & Miniatures Fair . 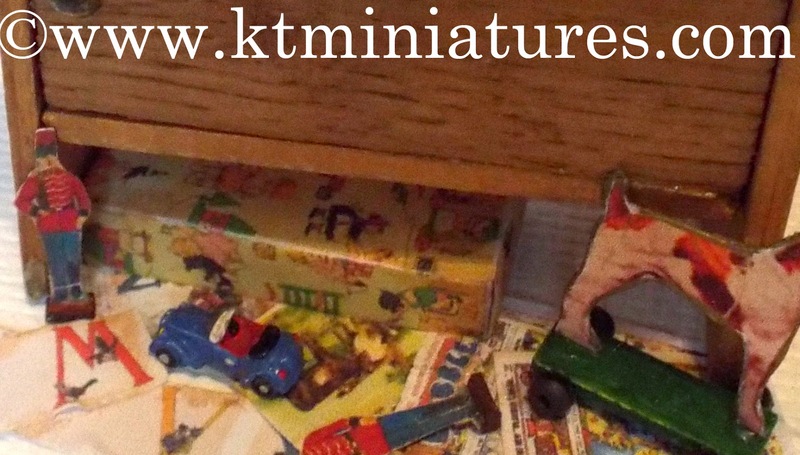 KT Miniatures Little Handmade Emporium. 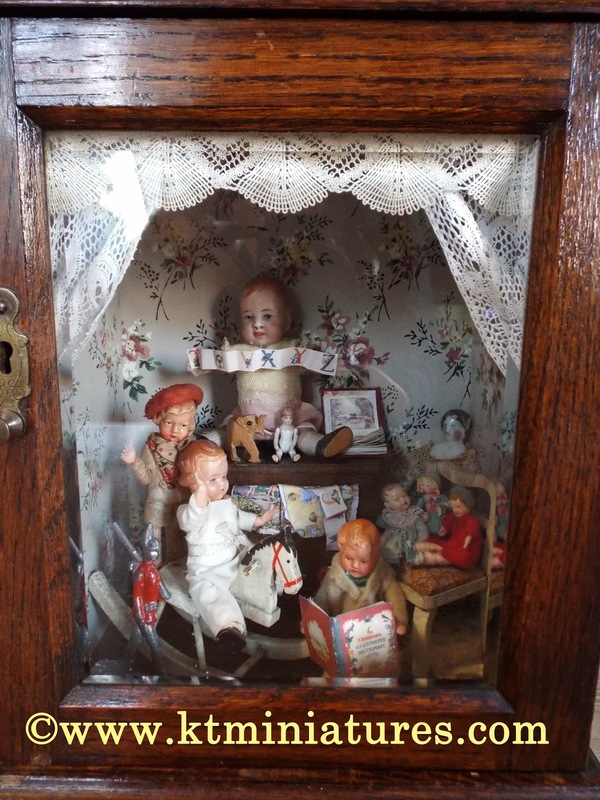 If you are familiar with KT Miniatures "Old Dolls House Gallery", then you may well recognise the name of Barbara Kendall Davies....some of her lovely old dolls houses feature as Collection Three on there. 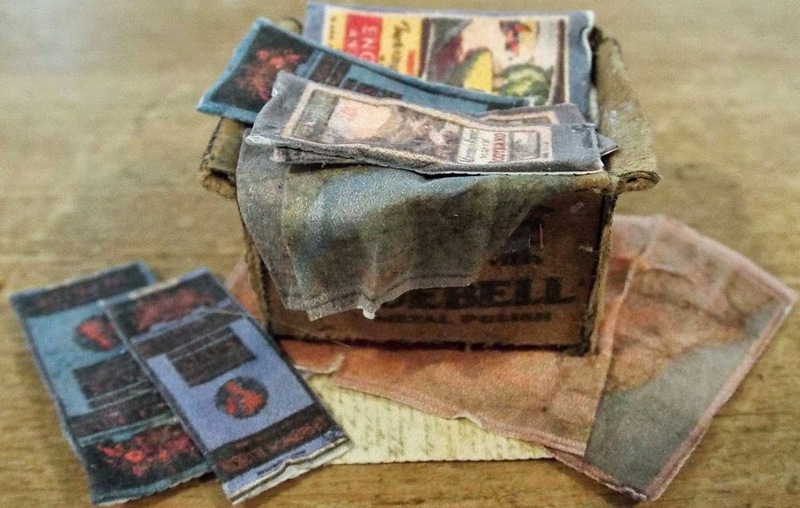 Through the world of miniatures, I have known Barbara for many years now and we discovered long ago that not only do we share the same maiden name of "Kendall" but we also both originate from a long line of "Kendalls" from Birmingham, UK! 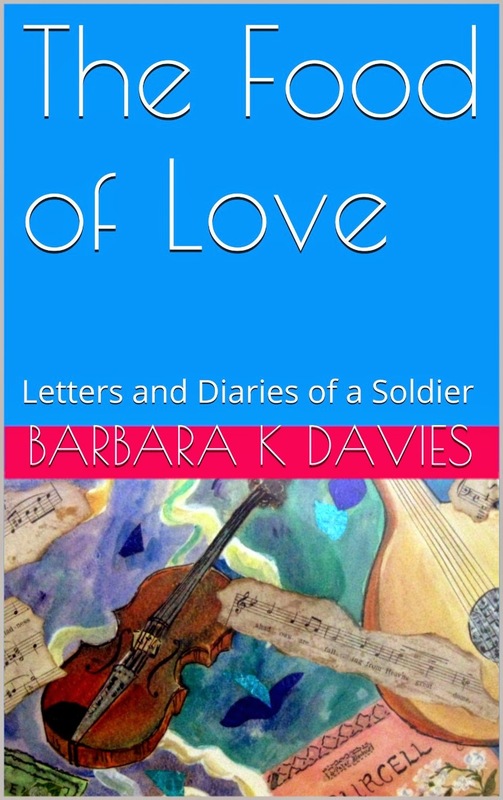 The Food Of Love is based on letters and diaries belonging to Barbara's father from the Second World War, including a picture of life on the Home Front. Barbara's father was a singer and the book details his experiences of entertaining troops as a member of Stars in Battledress (Norton Follies) and of the aftermath of war up to the Festival of Britain in 1951. 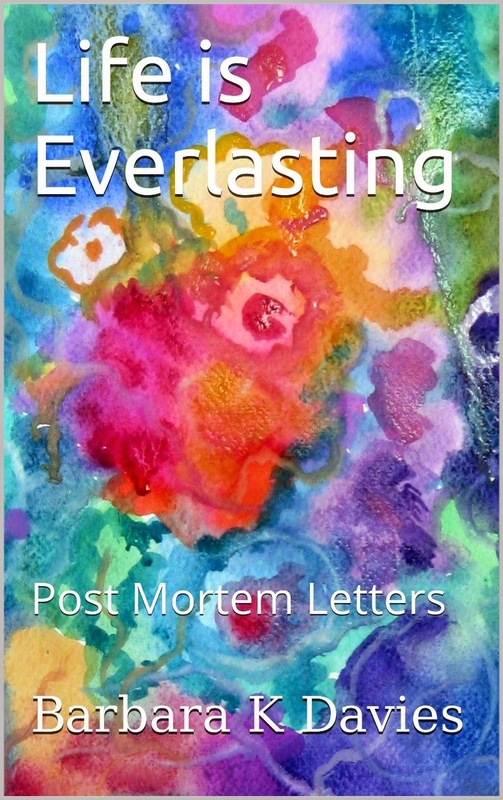 The second book - Life is Everlasting, has been thirty-two years in the making because of its unusual content. It requires the reader to suspend judgement on what we normally consider to be reality. Many people have unusual inner experiences but refrain from relating them as they do not wish to appear crazy. However, it appears that all human beings are potentially multidimensional. This book invites you to come on a journey of discovery not only in this world but also in the next. If you CLICK HERE, you will see that the first two books to appear on the page are Barbara's. Simply click on each of the main book images to view the relevant information. If you explore further, you will find that you are able to take a peek inside and read a free extract. In fact, I have already taken a peek at the free extracts of both books, and have found them quite enchanting and equally fascinating. For a while now I have been pondering on treating myself to a Kindle....so finally I have a REALLY good excuse to go and buy one! Am looking forward to reading both of Barbara's books in full.